Shelves revamp and make use of empty walls to display your products. 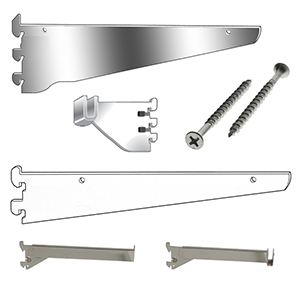 We have various brackets & accessories to fit on any 1” Slot Heavy Duty Wall Standards. Brackets extend and support your shelf to maximize the full potential of wall systems. The 14” Knife Edge Brackets create the most area to display multiple products. Use our shelf rest with the knife edge brackets to place tempered glass shelves. Use our flange brackets to drill wooden shelves onto the brackets. Hang clothes hangers, loops, and other hooks on our waterfall and faceouts. Each of our Brackets and Acessories are guarentees to withstand heavy merchandise with its 1/8” steel. American Retail Supply has been supplying retail stores with store fixtures, bags, gift wraps, and many other store needs. Call if you can’t find what you need, most of the time we will always find a way to get it or help direct you to the right place. 1-800-426-5708.